But many of the factors which influence portfolio decisions among active investors also play a role in how retired investors determine which allocations to alter and which to maintain. One of the factors which plays a huge role in the decision-making process of retired investors over those investors still working is risk tolerance. Put simply, retired investors don’t make risky decisions. According to the study, 83 percent of retired investors consider themselves to be either moderate (60 percent) or conservative (23 percent) investors. Such a cautious attitude toward investing keeps retired investors from making frequent decisions on investment and portfolio changes. Another factor in the decision-making process of retired investors is that 63 percent of them have a primary financial advisor who is likely to play a role. That is a higher percentage than among working investors (50 percent). Like all other investors, retired investors point to the investment performance of a product as the top defining factor. On a 0-to-100 scale, retired investors list that factor at 74.69. Slightly less impactful is the future potential of an investment, placed at 72.49 on the same scale. Advisors can start with the investment performance in conversations with investors, noting the factors which determine why an individual product is performing as well as it is. If a poor investment performance is leading an investor to drop a product, advisors can share their knowledge about whether current performance is likely to be maintained. Likewise, they can suggest a product which shows future potential but has similarities with the products already in the portfolio of the retired investor, who is not likely to be pursuing any product outside of their normal reach. According to the study, retired investors are more likely to take into consideration a recommendation from their advisor (rated at 62.26 on that 100-point scale). A dozen circumstances cause an investor-advisor relationship to strengthen when the investor becomes retired and this point of research indicates that retired investors tend to considering their advisor’s recommendations a bit more than working investors do. There are points of advice which retired investors take into consideration less often than do working investors, including the recommendations of financial “experts" on cable financial news programs, and concerns about whether the company has an international base of operations. On a personal level, retirees may listen to the advice of a financial advisor more than do working investors simply because they have fewer voices in their ear. Because retirees are often older, they are less likely to have parents to listen to, and since they don’t go to the office or workplace anymore, they don’t listen to work colleagues. 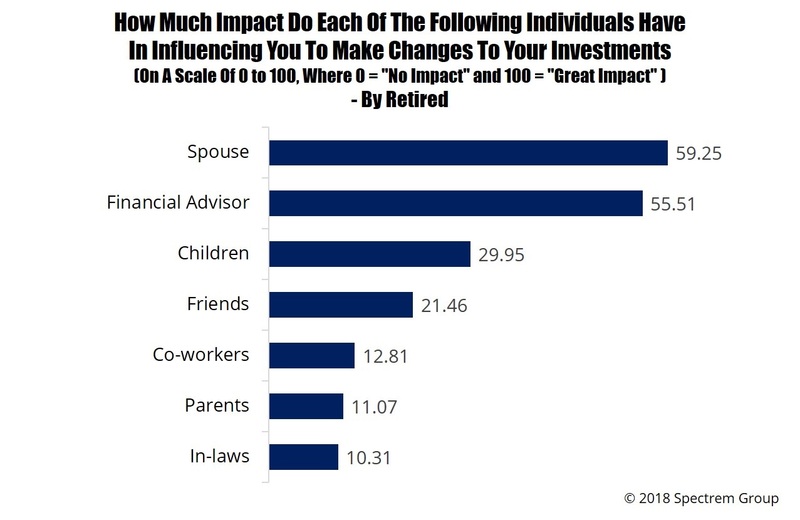 According to the study, there is a marked difference between the influence of friends, co-workers, parents, in-laws and even children than for working investors. Relying more heavily upon the advice of a financial advisor or spouse reduces the voices to listen to, the different points of view to consider, and the conflicts that come when the voices do not agree. In terms of searching out credible information from news sources, retired investors and working investors use many of the same sources to the same degree, led by national television programs such as CNBC or Fox Business and national financial newspapers such as the Wall Street Journal or Financial Times. However, 20 percent of retired investors look to proprietary articles offered by their advisor or provider on the company website to fill in some informational blanks, a much higher percentage than among working investors.